An evening in the country. Sounds wonderfully idyllic, yes? And so it was for the diners attending Heirloom Fire’s event at Mill River Farm in mid-July. I’ve been working on Jim Gop’s kitchen crew this summer and it’s always amazing to see the approach of his creative mind. It’s nice to have friends who do fun things. On November 4th, I met Brian (don’t call him “chef”) and the rest of the crew in the Beard House kitchen. Known as The Berkshire Pilgrimage––the meal highlights produce and meat from western Massachusetts. It’s a collaborative effort managed by Berkshire Farm and Table and the Main Street Hospitality Group (The Red Lion Inn’s parent company). Brian assembled a great group of Berkshires chefs: Adam Brassard, chef de cuisine at The Red Lion Inn (Stockbridge); Sean Corcoran, chef de cuisine at Eat on North (Pittsfield); Daire Rooney, chef of Mezze Catering + Events in the Berkshires; Dan Smith, chef-owner of John Andrews Farmhouse Restaurant (South Egremont); and Adam Zieminski, chef-owner of Café Adam. By the time I got there at noon, I felt like I was already behind schedule. The kitchen was buzzing with energy and good spirits. This a group that’s cooked together many times, and in a small space like the Beard House kitchen good interpersonal vibes are an essential ingredient. Brian threw me on fryer duty and I spent the rest of the afternoon channeling my deep-fryer mojo, labeling mise en place, and cutting up vegetables for family meal. It’s a real pleasure to cook with a group like this. This dinner was the sixth Berkshires-focused Beard dinner that Brian has spearheaded, and his 12th visit to the House. As a result, everyone knew the idiosyncrasies of the space: where to find equipment, which burners run hot, where the paper towels are, etc. so we were all pretty relaxed and ready by 5:45, when we took a brief break to enjoy family meal with Beard House staff. Roasted vegetables and onion dip. Ingredients for the dinner came from a multitude of producers across Western Massachusetts and just over the New York border. Berkshire Farm & Table promotes food culture in the Berkshires. The organization collaborates to cultivate tastemakers, produce events and foster dialogue in the media. By sharing the unique stories and expertise of culinary artisans, farmers and agritourism experiences, their work advances food as another reason to explore and savor the Berkshires. For more information, visit www.berkshirefarmandtable.org. I also became determined to find out how meat from pigs could be so different—and how I could secure a dependable supply of great pork for my own table. A little sleuthing revealed that the pig that produced the chop responsible for my epiphany was an old-fashioned heritage animal bred for flavor, not cookie-cutter leanness. It had spent its life with about 300 fellow hogs on the rolling pastures and woodlots of a small farm about an hour from my Vermont home. It had cavorted, rooted, wallowed in mud baths, snoozed in the summer sun, and dined on a plant-based diet. Its manure made the vegetation richer for future pigs. As I got deeper into my quest, which by then had become a book project, I spent a memorable day with a pig farmer in Iowa. He raised 150,000 hogs a year that produced meat of the sort that makes up 95 percent of the pork Americans consume. To prevent my bringing in diseases, I had to strip naked, shower, and put on special clothing, as did the owner and everyone else who entered the facility. In one dimly lit barn, more than 1,000 sows spent their entire lives in metal cages too small for them to turn around in or even contain their swelling, pregnant bellies. Piglets were raised indoors in groups of twenty or so in enclosures too small to allow them to take more than a step or two in any direction. The floor was slatted concrete that allowed the feces and urine to dribble into a basement-like pit directly below, where it accumulated, creating an eye-watering stench and emitting gaseous ammonia and hydrogen sulfide that would have killed every pig in the barn were it not for jet-engine-sized ventilation fans that blew the fumes outside, causing the air to reek for miles around. The hogs’ commercial feed included “animal protein” rendered from dead pigs, chicken litter (feces contain protein), and “feather meal” from poultry packing houses. Their feed also contained antibiotics, a practice that breeds resistant bacteria that kill 23,000 Americans a year. My taste buds were obviously trying to tell me something. At first, finding pork that met my new standards involved effort. I could order it online from a few suppliers such as Niman Ranch, which entailed shipping costs and more advance planning than I typically give to weeknight dinners. Then one Saturday morning, I noticed that a cheese maker at the farmers’ market I frequent had a cooler full of frozen pork. She told me her animals were free range and fed a vegetarian diet mixed with whey left over from her cheese operation. I became a customer. Around the same time, a few conscientious chefs in the area made deals with farmers to produce hogs, which they would buy whole and break down into an array of tasty, often imaginative dishes. After listening to the stories of these chefs and farmers and visiting a few swineherds , I settled on a simple principle: By any criterion—environmental, ethical, and gastronomic—factory-raised pork is the worst meat you can eat. By the same token, pork raised by small farmers near home is the very best. A year or so ago, the long-time meat manager at a nearby supermarket saw that an increasing number of his customers came in looking for the same sort of meat that I sought. He left his job, purchased a USDA-compliant mobile slaughter truck, and opened a meat market a about ten miles down the highway. Demand was so brisk that he soon opened a second store not much farther away up the road. For me today, getting great, local pork requires no extra effort, regardless of which direction I drive. You may not be as fortunate—yet. But in my travels, I have noticed that pork and other meats are on offer at more and more farmers’ markets. Websites such as Eat Wild (eatwild.com/products/index.html), Food Alliance (foodalliance.org/client-search), and Slow Food USA (www.slowfoodusa.org/local-chapters) have national listings of small, sustainable pork producers that can guide you to well-raised pigs living near you. Get to know them, but be warned, you may never visit the supermarket meat counter again. Barry Estabrook is the author of Pig Tales: An Omnivore’s Guide to Sustainable Meat. You can find his writing at Politics of the Plate. With all the bravado and ignorance of a Brooklyn street kid, I once thought I’d go live off the land someday, grow all my own food, raise animals, weave flax into linen. For various reasons, that never happened—but a sketch of my future farm would have looked a lot like Brook’s Bend Farm in Montague, where sheep graze, chickens wander, and faded red barns stand out against winter snow. That’s what you see if you drive by––the place looks like a perfectly contained family farm. In reality, owners Suzanne Webber and Al Miller have created a hub of interconnected enterprises. They turned Brook’s Bend into a shared resource for wilderness educators, an herbalist, a permaculture designer, and a pig farmer. Al and Suzanne raise sheep as they have done since 2003 when they bought the place. I discovered all this one afternoon when I was asked to pick up my grandson from Roots, a wilderness education program, which operates at Brook’s Bend. When I visited their website later I discovered that this 90-acre farm is growing food and healing plants, and helping a new generation of farmers and land-based educators get a start. Al and Suzanne are among those whom the New York Times referred to as “Agrarian Elders,” in an article in 2014. 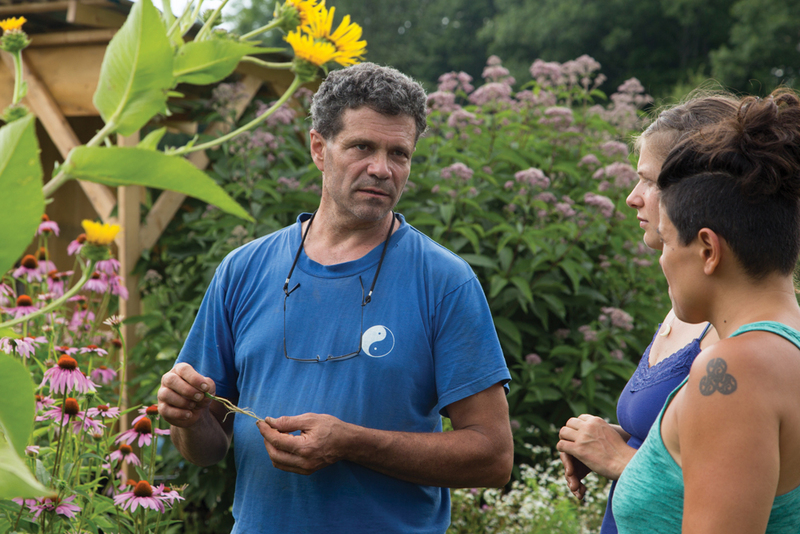 They have years of knowledge to pass along, a deep reverence for the environment, an aversion to one-acre house lots on some of the most productive farmland in the world, and they have Brook’s Bend Farm. In their sunroom where skeins of natural-dyed wool are stacked in shelves and woven rugs and throws hang from rods, they talked about the history of Brook’s Bend. In the beginning, Al said, “we ran everything on the edge of domesticated and wild.” In what they describe as “the time of the steep learning curve,” their Highlander cow went into heat during a storm that blew a limb down on her pen. She stepped out and found her way to a bull on a nearby farm. Al and Suzanne got a calf from that adventure. They had a dog that insisted on herding the turkeys. They had large gardens. It was a lot of work. Then they met Neill Bovaird, founder and director of Wolf Tree Programs, during a visit to the Montague Grange (now called the Montague Common Hall). Neill was looking for a home to expand his wilderness education program and that night Suzanne and Al invited him to visit the farm. When Neill first walked the land with Al, he pointed to a tree where he thought he might create a learning circle. Al nodded and then quietly led him to a huge ancient white oak. Al said, “I’ve always imagined a classroom under this tree.” Neill agreed, and now this “wolf tree,” so named because it has grown huge and dominant, is the centerpiece of a program where children and adults learn wilderness skills and develop a deep respect for the natural world. The outdoor programs run year round, in all weather. Wolf Tree is not the only wilderness program. Full Moon Girls, run by Dhyana Miller (no relation to Al) focuses exclusively on the needs of young women. Dhyana believes that girls thrive in a female environment. At Full Moon Girls they seek out adventures, prepare herbal remedies, engage in storytelling, and follow their passions guided by women mentors. A tranquil afternoon spent there proved all of this to be true. Girls, grubby from gathering firewood and mucking in the stream, talked, enjoyed long silences, showed me the things they’d made, and demonstrated how to take the sting out of young nettles. On a sunny field across from the sheep meadow, Chris Marano, a “world-class herbalist” according to Al, grows medicinal plants. He lives down the road, and when he was looking for a place to do this he simply knocked on Al and Suzanne’s door. They connected, and Clearpath Herbals became part of the Brook’s Bend family. Chris describes himself as a community herbalist. In addition to teaching he offers clinical health consultations and custom-blended herbal preparations for people looking at alternative medicine. The garden and the forest at Brook’s Bend are an extension of his classroom and the source of his apothecary. 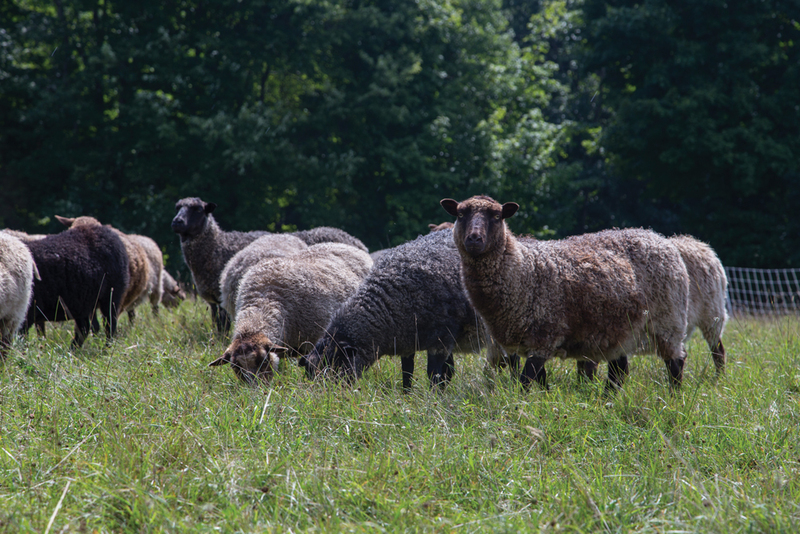 Grass-fed lamb, wool, and textiles are the cornerstone of the farm. Brook’s Bend lamb is raised on organic, re-mineralized pasture with nothing but the sun, pasture, and forest edge in them. Al and Suzanne would not let me leave without taking lamb loin chops along with me. They were perfect sautéed with garlic and fresh rosemary. Tyler Sage is the latest addition to the Brook’s Bend Community. He raises pigs that are a cross between a Hereford boar and Berkshire Hereford sows, both heritage breeds in need of preservation. Tyler said, “They are a nice combination of fat and lean.” He sells whole pigs to Sutter Meats in Northampton, and frozen cuts to farm stores and at farmers’ markets. Tyler is committed to farming and has been for a long time, but like most young farmers he cannot afford to buy land. He said, “Al and Suzanne’s support has been crucial to the development of the business.” He pays rent for a house and access to the barns. Tyler invited me to a barn to see a sow and her piglets on a cool April morning. The sow was enormous with clear eyes and a beautiful brown bristly coat. Sunlight filtered through the barn. The hay smelled sweet. With the lambs grazing across the street and the pigs cozy in the barn, all seemed well at Brook’s Bend that morning. There’s a powerful sense of place there with people who are right where they want to be doing exactly what they love to do. Four Star Farms grows many varieties of grain and offers whole grains and whole-grain flours for sale. They mill to order, once a week. Place your order online or by phone. You can have your order shipped to you or pick up your fresh-milled flour (by appointment only) at the farm. Upinngil Farm grows organic grains and offers them for sale at their self-service farm store. You may buy whole grains to take home or grind them yourself in the store’s mill. Pioneer Valley Heritage Grain CSA offers a range of grains to its CSA members. Shares are on sale now for delivery later this year (check their website for details on pricing, share sizes, and grain varieties). The CSA offers milling options at various pickup locations around the Valley. Want more whole-grain goodness? Read on! Properly stored, whole grains can last almost forever. To avoid pantry moths, keep grain in covered containers in a cool, dry place (the freezer is great) until ready to use. Whole-grain flour is another story, however. It should be stored in the freezer, but for the best flavor, flours should be used soon after milling. Try experimenting with different grains and different combinations of them. Thanks to the variety of grains available, you can try using spelt, emmer, rye, triticale … Find your perfect flavors and create your own “house” flour blend! Whole-grain flours can feel gritty when you work with them, and they need a little more time to absorb liquids. Especially in bread recipes, like the chapati, you’ll get better results if you let your dough rest: a sticky dough can become supple and easy to work with. A common warning when baking is that a lot of stirring can toughen up baking goods. That is true with flours that have had the bran removed (like all-purpose flour)––overworking forms gluten strands that can toughen up your baked goods. But in the case of whole-grain flour, the bran “cuts” the gluten strands and keeps things tender. This is why the pancakes in this recipe don’t become leaden hockey pucks, even after taking many spins around a blender. Baking with fresh local flour at home is something every baker can try, but how’s a local grain lover who doesn’t bake going to get their fill? Fortunately for bread lovers, plenty of local bakeries are using local fresh-milled flour in their goods. Rose32 co-owner and master baker Glenn Mitchell is one, and he goes hyperlocal with the bakery’s Hardwick Loaf. The Hardwick Loaf could be considered a nearly 100% local loaf of bread (salt being the only ingredient not sourced locally). Mitchell purchases the wheat for this bread from Hardwick farmer Stan White. 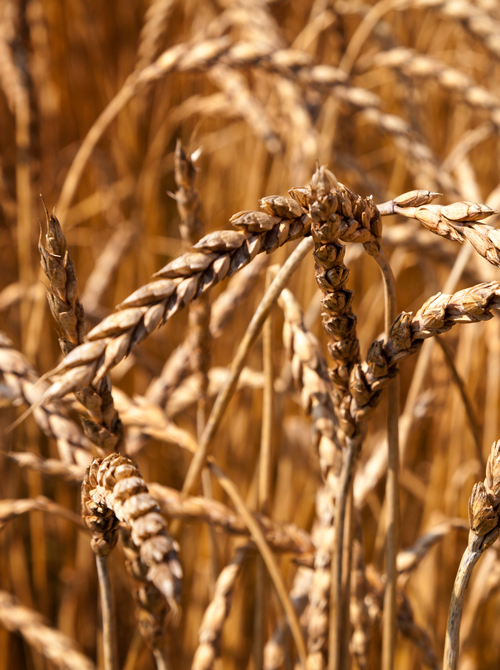 The wheat variety White grows on his farm, located less than three miles from the bakery, is called Redeemer. Mitchell describes this Hardwick-grown, hard red winter wheat as the “best wheat for me.” Each week he mills between 30 and 40 pounds of Redeemer himself (another 100 pounds of Redeemer goes to Four Star Farms for finer milling there). This whole-grain, coarsely ground flour goes into the Hardwick Loaf. Mitchell uses a sourdough starter to leaven the bread. It takes about 60 hours for one batch to go from grain to oven. Many of Rose32’s other breads are made with local wheat: Henry’s Harvest, the Local Loaf, and the Market Loaf use fresh-milled Redeemer and/or fresh-milled flours from Four Star Farms in Northfield. If you are making a trip to Rose32 for a local loaf, it’s best to call the bakery at 413-477-9930 for availability as not all bread types are baked every day. 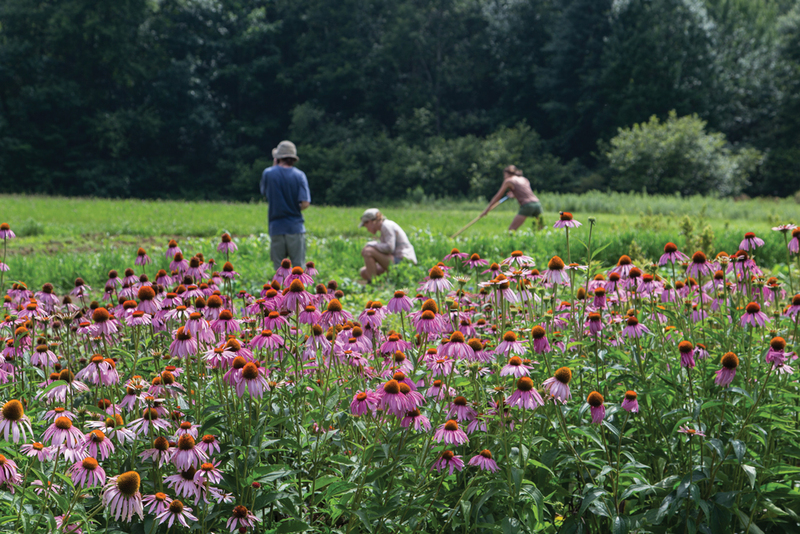 For a local take, read about Seed Saving and Sovereignty in Easthampton. Samantha Marsh's story on a new seed bank in Easthampton here. When you buy that magnificent heirloom Cherokee Purple tomato, or the clever, open-pollinated inside-out watermelon radish, or the delightfully fragrant lemon basil plant from your local farmer, you're participating in what is arguably the most important food preservation effort on the planet. And in a grand way, too. By selecting open-pollinated or heirloom varieties, you're signaling your interests and preferences to the grower, who will use customer buying patterns to decide what she plants next year, and how she'll expand her offerings with unique open-pollinated varieties. The farmer will then purchase seeds from a fellow grower who has carefully nurtured those varieties from healthy plant to healthy seed. That purchase encourages the seed producer to broaden his open-pollinated plantings, as he learns what farmers need for their direct-to-consumer businesses. And soon, we have a wider variety of produce from which to choose, and more importantly, you, I, and others across the city, region, and country, can help slow the alarming trend of global biodiversity loss. Biodiversity encompasses the unique varieties of life on earth – human, plant, animal, insect, avian, marine, soil microbes, etc. – and the intricate and critically important interdependence that exists among them in the global ecosystem. Our planet has experienced an alarming decrease in the variety of species thriving today. In food terms – that is, in agrobiodiversity terms – this is very bad news. The Food and Agriculture Organization of the United Nations estimates that we've experienced a 75% loss in genetic crop diversity in the last century, due in significant part to the advancement of industrial agriculture, which requires efficiency and simplification through monoculture (i.e., a large industrial farm growing only corn – and perhaps just one variety at that – rather than corn, plus various cultivars of beans, squash, garlic, onions, and tomatoes) to be productive and profitable. Absence of diversity threatens global food security: as we have fewer and fewer fruit and vegetable cultivated species, the risk of devastation by pests and disease looms large. Think of it in terms of your financial portfolio: your advisor encourages investment diversification to stabilize your overall wealth. If you invest everything in Acme Sprocket, Inc., and Acme Sprocket goes under, so does your portfolio. But if you spread your investments among multiple companies with unique operations, the loss of one company or a tilt in one business sector will be compensated by the health of the others. The massive potato crop losses throughout Europe in the 1840s, leading to the Irish Potato Famine and the starvation deaths of almost one million citizens, is an example of an agrobiodiversity disaster. None of the potato varieties grown in Europe at that time was resistant to the particular strain of potato blight that destroyed the crops, nor was the Irish Lumper variety upon which the Irish population solely depended. An agrobiodiversity crisis of this type also has cascading and long-reaching effects: not only is there crop loss in a given growing season, but once the crop fails there are no healthy specimens remaining from which growers can take seed for future years. When we speak about preserving crop agrobiodiversity, the focus must always turn to the viability of seeds and their ability to reliably reproduce the same crop year after year. Open-pollinated varieties are the answer to this need. Hybrid varieties grown for commercial sale are the result of controlled cross-pollination, with the intent to favor certain characteristics – not just color and flavor, but also disease resistance, growing habits, and higher yields. Hybrid strains, while hardy producers in the first year, are actually genetically weak, and seeds taken from the fruit of a first generation plant will not produce the same plant or fruit on a second generation plant. For example, in one recent year, I grew a hybrid red cherry tomato plant in an isolated spot in my yard. Seeds from its fallen fruit volunteered the next year, producing grape-shaped tomatoes with green shoulders and an undesirably bland, winter-tomato quality flavor. If we want to preserve the edible crops on our planet and protect ourselves from food crises caused by biodiversity loss, we must save and expand the world's cache of open-pollinated seeds. There are many significant operations devoted to doing just that, globally, nationally, and locally. Over 1,700 seed bank facilities exist around the world today. Their raison d'etre is to collect, preserve, maintain, and regenerate seeds from species that are at risk for extinction, regarded as critical to the global ecosystem or food supply, or are particularly suited and relied upon as crops for the region in which the bank is located. Seed bank facilities are large and complex in their operations, as they are charged not just with seed collection and storage, but also tracking and cataloging every seed in their facility, which is an enormous responsibility. The storage units themselves must be carefully monitored and managed for optimum climate and temperature (-18°C is the international standard for seed preservation). Many have labs and scientists on staff devoting their efforts to gene research, species health, and improving preservation practices. A critical part of the seed saving process at these banks is ensuring that the entire collection survives: seeds must be periodically checked for viability, grown to maturity, and evaluated for health and hardiness to replenish the collection with fresh seed. Seed banks can be associated with and/or funded by governments, universities, or private trusts or organizations, but are generally inaccessible to the public (in terms of requesting seeds or storing seeds). The world's largest seed bank is the Millennium Seed Bank in the UK, near London (although they do not focus on food crop seed saving), storing almost two million seeds at present. Located as close to the North Pole as it is to its governing country of Norway, this underground fortress was built into the side of a sandstone mountain on the Svalbard archipelago with one goal in mind: to provide a fail-safe and permanent storage facility for genetic crop materials with protection against threats both man-made (such as war and large-scale accidents) and natural (climate change, natural disasters). An insurance policy, if you will, for the world's food supply. Opened in 2008, the Svalbard Vault is an extension of the work performed by seed banks. One can think of the vault's purpose as a safety deposit box for seed banks: banks store backups of their seeds in the vault, often in addition to backups that already exist onsite at seed bank facilities. No genetic research or lab work occurs at the vault; it is simply a high-security storage facility. Each seed bank is responsible for testing and regenerating the seeds they store in the vault to ensure viability, and banks can access only their own seeds. The location was selected based on a variety of factors. Its arctic permafrost climate ensures appropriate freezing temperatures that will protect the seeds even in the event of power failure within the vault. The thick walls of the structure and the mountain surrounding it provide more than adequate insulation to sustain proper temperature. It's location far above sea level ensures safety from floods. The region is geologically stable with a notable absence of tectonic activity, and engineers constructed the walls of the vault to withstand forces such as explosions and earthquakes. On an island with more polar bears than humans, it's an unlikely target of invasion. These factors and more compensate for the physical vulnerabilities of standard seed banks, where an unexpected power failure could put the bank's entire collection at risk. At the community level, many home gardeners are devoted to the practice of seed saving, and regularly connect with other local growers to share their collections and discuss successes and failures with specific varieties. These casual associations often transform into something more organized, such as seed swaps and seed libraries. A swap is an event where gardeners meet in person to exchange seeds they've harvested from their year's plantings, usually for free. Seed swaps are an easy and socially engaging way for home gardeners to gain access to seeds of varieties they've never grown, and to see firsthand the diversity of plantings in their area. Seed libraries are small to medium sized operations that gather seeds – often through donation of home gardeners – in an organized fashion and retain them for sharing. Unlike seed banks, whose purpose is to collect and store seed, a seed library collects and distributes seeds to gardeners in its community. Similar to a book library – and, indeed, seed libraries often find convenient homes within existing book libraries – seed libraries catalog and inventory incoming donated seeds, and then those seeds are "checked out" to growers, much like books, often with the expectation (or at least the hope) that the gardener will save and return a fresh set of seeds at the end of the growing season, along with an account of how the plant fared. In this way, seed libraries hold the unique position of seed depository, seed distributor, and seed educator. Sadly, however, seed libraries are currently under fire. In a well-publicized action last year, the Pennsylvania Department of Agriculture brought the hammer down on one public library's new seed lending program, citing the potential of "agroterrorism" through the library's public and unregulated activities. According to Pennsylvania's Seed Act, seed growers must jump through a number of hoops, including purchasing a license, keeping complete records along with samples, and submitting their seed for testing before distribution can occur, in the interests of ensuring seed health and labeling accuracy. All of which is overkill for home gardeners just looking for new varieties of heirloom tomatoes or squash to sample, so the library ceased its seed program. Although smaller in scale to banks, seed swaps and seed libraries contribute to biodiversity both in practice – by encouraging the growth and seed replenishment of open-pollinated varieties among farmers and gardeners – and in education. As these activities spread across the country, so does awareness of the importance of biodiversity and preserving and sharing open-pollinated seeds. Facebook is a popular platform for swap and library members to stay in touch with each other. I began saving seeds out of curiosity (and a little bit of awe): could it really be that simple, letting seeds dry on their own, tucking them into a cool spot for the winter, and next year I'd have my own collection of seeds? Indeed, it was. I started with herbs, and to this today they're my favorite seed saving subjects. I recommend growing cilantro or dill as a first project, as their seed heads are large and beautiful, producing fully visible seeds, thus making easy observation of the plant's seed development. Let the seeds dry right on the plants. It will take a couple of weeks, but you'll know they're ready to harvest when the seeds have turned brown and dislodge easily from the stems (coriander seeds are small and round with ridges; dill seeds are flat and tear-drop shaped). Cut the seed heads from the stem and shake the seeds into a paper bag. Clear the seeds from other plant debris and store them in an airtight container in a cool spot. That's it – so easy. Plan on growing extra of these two herbs: not only can you save their seeds for next year's plantings, but they're also great in cooking and, if stored whole, you'll have a long-storing supply of coriander and dill seed (dill pickles!). In the hilltowns of western Massachusetts, in the small town of Ashfield, you’ll find Bear Swamp Orchard, a small organic apple orchard run by the Gougeon family. Jen Williams and Steve Gougeon operate the orchard along with their sons, Aidan and Elliot. The orchard offers pick-your-own during the early fall months (starting in mid-September), hosts hard cider tastings throughout most of the year, and they make and sell both organic sweet and hard cider made from their own apples. Bear Swamp Orchard is located on land that has nurtured apple orchards for over 100 years. In the 1950s the whole area was entirely apples, but toward the mid-1970s, some of the orchard was cut and burned and switched over to pasture. As time passed, woods took over the old orchard. Any apple trees that remained were embraced and hidden by the trees that grew around them. When Steve was young his parents, Melinda and Richard, moved to the site and built a house right next to the old, still-hidden orchard. In the mid-1980s, an apple-growing neighbor helped out when he came through and cleared out the trees that weren’t apples, enriched the soil, and planted new apple trees. Many years later, when Jen and Steve finished school, they moved back to the area, their family, and the orchard. Steve, who’s also a carpenter, built a second-family addition to his parents’ home, bringing three generation to live on the property. Jen and Steve decided to return the orchard to its former productive state. “It was sad to see all these apples fall on the ground and just rot. So we decided we wanted to try and take care of it,” says Jen. They knew there were more apple than they could consume, so in 2006 they began selling apples and offering pick-your-own apples as well. They have since put in five acres on two fields and planted more varieties of apple. This is an exercise in patience, as the trees will take years to produce fruit. The Gougeons have worked since the beginning to make sure the orchard is growing in a sustainable and holistic manner. The apples share the land with their animals: a llama named Fern and some Shetland ewes, which help by grazing the pasture and orchard. Steve and Jen had been making hard cider for themselves for many years. “We realized we could share a lot of the fruit with other people, but the thing about organic production is that the majority of apples are not dessert-quality fruit, people aren’t buying them in stores. So you need to have some plan for all those apples that people don’t want to just pick and eat. That’s where hard cider comes in,” says Jen. They had already done the organic hurdle, so now it was a matter of time overcoming the level of paperwork that involves the selling of alcohol. It was a lot of work, time, and patience, but they knew it was worth it. The process they use to make their hard cider is a traditional one. They ferment the juice with wild yeast and use lots of wild organic apples that are harvested when fully ripened. They also don’t interfere with fermentation by filtering or by adding other processing and fermenting aids. Steve says, “We did many yeast trials and we realized that none of the yeast you could buy gave us a better ferment than leaving it alone and letting it ferment by itself. Our process has always been simple.” There are six varieties to choose from, including New England Hard Cider, Sparkling Organic Hard Cider, and Hop Hard Cider. This year, they put in a new production building and tasting room. They offer hard cider tastings and you can purchase cider, baked goods, and other local products in their shop. Steve is now a full-time cidermaker and orchardist and part-time carpenter. Jen teaches part-time when she is not working the orchard and cidery. They do most of the work themselves, but are able to bring in family or friends when they need a little extra help. Their two boys, Aidan, and Elliot, help out as well, but Jen and Steve keep their ages in mind, so they don’t put too much on them. But the boys like to lend a hand when they can. It has taken time to build Bear Swamp Orchard to where it is today. Like the slow growth of an apple tree, their efforts have taken time to yield fruit. Thanks to their passion for the orchard and the cidery, the Gougeons’ relationship with their land is one that will endure. Visit the website or call for tasting room hours, Pick Your Own information, and details about ciders. Awareness of "food waste" has become the topic of the day in my world. I know that I live inside a small bubble of food-loving and -obsessed people. Concerns about the volume of food that ends up in landfills as opposed to on our plates have become a major topic for discussion. I have a lot of imperfectly-formed thoughts on this subject and am reserving those until I feel I have developed a more articulate thesis. That said, when I heard that Dan Barber, the chef of Blue Hill and Blue Hill at Stone Barns, was going to host a "popup " series focused on this issue I was really intrigued. Then, when I realized that an already scheduled trip to NYC would coincide with the series, I was in. The conceit of wastED is to challenge chefs and purveyors to find uses for food that is normally diverted from the "food stream." (My words, not his.) The extensive a la carte menu offered 21 dishes, all comprised of ingredients that would have either ended in landfill/compost, dog and cat food, or run down the drain. All dishes were priced at $15, which removed one decision-making variable. I was dining solo, so I made an effort to try a variety of dishes while ordering too much. The irony of wasting food at a food waste-awareness dinner as a result over-ordering was not lost on me. So, here follows a summary of my experience. I took photos for my own reference, but they are really not suitable for sharing (so dark in there!). I'd never dined at Blue Hill, but just walking in the door, I could tell that the restaurant had been transformed visually from its usual fine-dining look. My experience as a gardener told me that the walls and banquettes had been draped with Reemay, a row cover that I float over my garden to protect it from frost. It created an ethereal, cocoon-like effect. Knowing the intention of the event, I have no doubt that it will be reused back on a farmer's field later this spring. The tables were set with resprouted vegetables--celery and bok choy plants had been regrown from their root ends (Cut a head of celery or choy about 3/4" from the bottom. Rest that root nub in water and a new plant will regrow. Pretty neat, yes? And very pretty.). Tables were laid with brown paper and set with a candle. The tabletops were made of mushroom growth medium (mycelium, think mushroomy styrofoam) and a fiberboard top made of some post-consumer product (I didn't get the actual product name, but will). Onto the food and drink. I'm providing the menu descriptions as written by wastED. I started with "The Boiler Maker: MacKenzie bourbon infused with walnut press cake (byproduct of nut oil production) infused bourbon, flat beer syrup, spent coffee grounds bitters." It was a nice take on a Manhattan, served up in a rocks glass so the aromas really concentrated. After my cocktail was gone, I moved to rosé (Matthiasson, Napa, 2014) for the rest of the meal. Bread was presented at table: two hearty slices of spent grains bread (made from the grain left after beer brewing). The bread was served with two small dishes: one containing whipped lardo and cracklings, the other held salt, pepper and rosemary. The server picked up my candle and poured the melted wax over the salt and pepper. 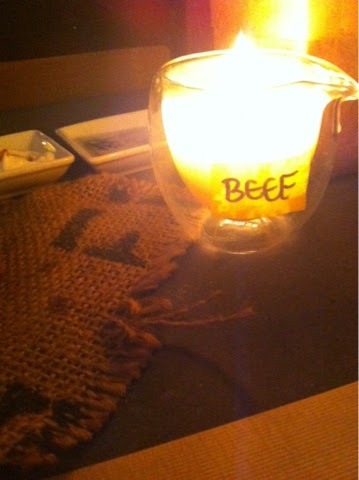 He turned the candle and I could see it was labeled "beef." It was tallow, and it my candle had become part of the bread course. This was probably the most "tricksy" thing I saw all night, and it delighted both me and the server, who told me he just loved that reveal moment. And it was delicious. The tallow got a little toasty from the candle flame. I'm a huge lardo partisan, but that beef fat won (and stopped) my heart. "Stew of kale ribs: pockmarked potatoes and parsnips, shaved immature egg yolk." This was a creamy stew (it reminded me a lot of a soubise, the classic French onion-rice sauce). Beautifully cut batonets of potato and parsnip and thin kale stems. I'll confess that I wanted more kale, but it was nice to see something that I think of as a very fibrous ingredient become so tender. The immature egg yolk was a fun touch. When a laying hen is slaughtered, she will frequently have eggs "in process" internally. These yolks look just as you'd expect. They were cooked (I'm guessing cured, actually, though I forgot to ask.) and then the servers microplaned a small shower of the yolk over the stew. "Monkfish wings: brine from the olive bin, trial fish pepper hot sauce." According to the extensive glossary provided on the menu, monkfish wings are the bones attached to monkfish fins (I had originally thought that what I was served was actually collar, but the menu tells me otherwise). Monkfish is a species that even a nose-to-tail chef like me almost never sees head-on. There is little market value in the head, so most fisherman toss the head and fins overboard to save space in the hold. The wings were deep fried and served with a little squeeze bottle of hot sauce. I worked with fish peppers a few years ago for a special event, and my fingers tingled with phantom pain (way back when, I didn't wear gloves and the capsaicin kept my fingertips humming for days after the event). There was a surprising amount of meat on the wings, and like the tail meat we are more familiar with, it was succulent, almost a bit springy. "WastED special: April Bloomfield remains of fins and field: local mackerel and fluke trim, red wattle trotter and head, lacto-fermented pulp, pickled vegetable scraps." This dish was served in a shallow bowl, and a fish broth was poured around the contents at table. Elements included a pair of fish balls (no, not that kind of fish balls!) made from fluke and mackerel. They were a little bouncy, not in an unpleasant way, and they were a nice contrast to the crunchy fried mackerel tail that garnished the plate, the broth was very delicate and let the flavor of the garnishes, the fermented pulp and shreds of pork, show through. "Rotation risotto: second-class grains and seeds, squash seed pulp, pickled peanuts, spent cheese rinds." 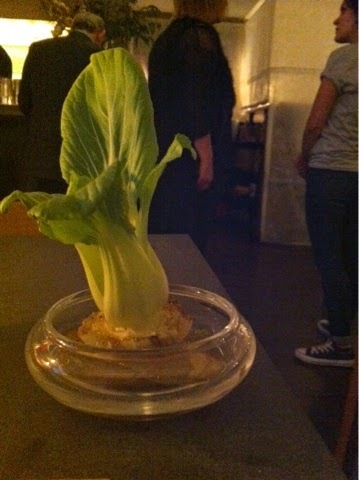 I was so excited to see this dish on the menu. Chef Barber spoke at Edible Institute last year, and he described this dish as the starting point for his musings on "use it all." The "second-class" grains and seeds referred to are the grains that his farmers grow on their field as part of crop rotations. In order to build up soil fertility and variety of grains and legumes are grown and then tilled in. His farmers are now harvesting some of that food before he plants are returned to the soil, and these grains make up the base of the dish. To me, this is one of the most exciting dishes on this menu. It represents a way in which farmland can be used to produce food year-round, and provide positive inputs to the soil without the addition of supplemental fertilizers. "Dog food: unfit potatoes and gravy." As the menu tells us, this dish was inspired by the dog food produced by Dickson's Farmstead Meats. They use their unsellable offal cuts to produce a sellable product, dog food. Barber fleshed out (pun unintended) this rich meatloaf-like dish with the meat from a seven year-old dairy cow (when dairy cows are "retired" from service, they frequently are sold for dog food, as they are not seen as fit for human consumption). The dish was garnished with a little snowdrift of potato rissole (appropriate because it was snowing all through dinner). This plate was delicious, but very very rich. To cap off my meal, I concluded with "Double whey bread pudding: whey caramel, roasted reject apples, cacao pod husk whey sorbet." I opted for a option in which pork blood was substituted for the cream in the pudding custard. That option gave me a reverse supplement: I got 95 cents off for going "bloody." I really enjoyed this dessert. The sorbet had a very robust chocolate note from the husks (which gardeners would also recognize as the cocoa hull mulch you can by buy at garden centers). The pig blood gave dessert a rich, very savory note. I could imagine it being off-putting to some, but the apples brought enough acidity to counteract the "porkiness." If you live locally, I strongly urge you to make the time to visit this event before it ends in a week. Some of the dishes do seem overly designed so as to use as much "waste" as possible, but the results were consistently excellent. The dinner series is reservation only before 9, with walk in tables available later in the evening. This conversation should and will continue. I am very excited to see how we can bridge the gulf that lies between educating those of us who can afford a dinner like this one, and those who are actually going hungry. If wastED keeps us talking, and keeps us thinking creatively about diverting food from the waste stream, all the better. On a sundrenched Saturday morning, I walk into the white-walled dairy room dressed in a chef’s jacket and hairnet, ready to learn the secret behind their notable Upinnzellar (Swiss-style) cheese. Within minutes I discover that cheesemaking is both an act of passion and gentle technique. As it goes in most kitchens and science labs, temperature and method matter. Cliff pours raw milk into the 60-gallon cheese kettle to warm before adding the culture. The Farm’s Ayrshire cattle produce high-protein medium-fat raw milk fit for cheese production. Two hours later, the rennet is stirred in. Once the curd sets, it is cut into uniform cubes then stirred and cooked for another hour and a half. The curd is done when it can be formed into a ball. Curds and whey are separated with cheesecloth. Drained curds go into a cheese mold before they are covered and pressed overnight. The next morning, the cheese is removed from the mold. Cliff coats the cheese with dry salt and lets it sit before the cheese is wrapped and placed in a two-door “cheese cave” to age for three to six months. After a day spent at Upinngil, I understand the craft behind their cheeses, and feel lucky for both the knowledge and company. Nikki Gardner is a writer and photographer whose work has appeared in Artful Blogging, The Huffington Post, Smithsonian’s Food & Think, and The Daily Meal. She shares seasonal vegan and vegetarian recipes on WWLP’s Mass Appeal and in her cooking classes at Different Drummer’s Kitchen in Northampton. Find her online at Art & Lemons, where she chronicles everyday life in food, photos, and stories. The morning I drive to Black Birch Vineyard the leaves shine bright yellow against a gray sky. It's been raining all day, but by the time I pull into the parking lot the clouds have cleared, revealing the winery against one of the town's many fantastic vistas. Today there's a small crew of four (plus a toddler in tow, eating grapes) harvesting some of the vineyard's Corot Noir, Noiret, Marquette, and Cabernet Franc. They're part-timers, the owner's family, and the owners themselves. Throughout the early afternoon, bunches are handpicked and tossed into white bins. The morning's harvest has been delayed by the rain, but by two o'clock the farm is bustling. “I can't do it all,” he says, alluding to the fact he has helpers when they reach their highest volume. The tiny vineyard is on the eve of its peak harvesting time, and Ian warns me that by next week he won't have any time to talk. The winery has doubled its production since last year. Co-owner Ed Hamel is older than Ian, and more relaxed. He has just returned from a trip to the fingerlakes to retrieve grapes when I meet him. Black Birch makes their wines with a mixture of their own grapes and picks from other vineyards in Massachusetts, and the Finger Lakes. Sourcing from nearby vineyards is a common practice that helps new wineries stay cash positive while they're young and still working out the kinks. They choose the grapes based on their similarity to what you would find in the region, which for Black Birch means a mixture of 17 traditional European grapes and American hybrids bred to withstand harsher winters and shorter growing seasons. Just as Ian is monitoring the wines, Ed is busy tending to the vines. He's testing their sweetness, making sure they're properly protected, taking account of their growth. The number of small wineries is growing rapidly in the state, but Ed thinks it's going to be a while before Massachusetts its recognized as a great place to cultivate and make wine. Because of the climate and the terroir and the unpredictable weather, Massachusetts wineries are up against some tough challenges. But we've been given some gifts as well. Although our regions may never have the ability to produce deep, full bodied red wines, Ed notes that medium-bodied reds are easier to pair with a meal. Likewise, you don't need a long growing season to produce whites with beautiful acidity. Just as the Finger Lakes have gained prominence for their Riesling, Ed is confident the Northeast will find their niche. The makers of Black Birch are fueled by their passion for the product and the region, and they're completely self taught. Ian says he's experimenting all the time, which is both exciting and stressful. When I visit Black Birch, they are on the precipice of their busiest time, the peak of the harvest. Ed predicts it will coincide with the height of fall foliage. This is time when they've absolutely got to get the grapes off the vines and make the majority of this year's vintage. They only have a few barrels aging in the cellar today- but they're about to have many more. Ed says they're going to be harvesting a lot more this week. Some nights they might be up until 4am. “When the crush comes, you just do it. And you love it. Gwen Connors is a freelance writer and baker based in Northampton, MA. Last weekend, as the sun shone unseasonably warm and the turning leaves gleamed red and yellow, my family and I headed down Route 2 to Orange for the 16th Annual North Quabbin Garlic and Arts Festival. We've been to several farm festivals already this year, but we were all in agreement that this one was our favorite. Though over 100 farms, artisans, restaurants, and community organizations are represented, the festival maintains a cozy atmosphere. Browsing vendors' booths, we discovered fine art, wood and fiber crafts, and fresh produce. Music and dance performances took place on two different stages, ogres and trolls roamed the grounds, dozens of hula hoops were strewn welcomingly in the grass, and tucked between the Australian sheep dog herding demonstration and a young 4H-er's yoked pair of silvery cows, sat the spoken word stage. The compost and recycling bins located throughout the event are impossible not to notice. That's because the Garlic and Arts Festival is practically trash free. The final numbers for this year aren't in yet, but past years' tallies counted only three bags of trash produced from over 10,000 visitors to the festival in one weekend. This commitment to conscious consumption is seen throughout the event in the solar powered stages built from locally harvested wood and the multiple workshops and tents devoted to environmental and renewable energy education. The entire weekend is designed around making it easy for folks to make green choices. Free shuttle service, preferred parking for carpoolers, free drinking water to reduce plastic bottle use, and local vendors representing local choices for food, arts, and services. Among these local vendors, I met John Armstrong, manager of New Salem Preserves, who taught me about the qualities of crab apples (namely, high pectin) that make them perfect for jam. While John told me about the small farm's apple products and encouraged me to visit their farm stand, my family devoured New Salem Preserves' apple cider donuts - fresh, sweet, and still steaming. As is my habit, I spent a little extra time in the fiber tents, and so met Hilary Woodcock of Woodcock Farm in Belchertown. As she sat spinning yarn at a large wheel in the sun, she walked me through the contents of her tent: everything is knit, spun, or simply gleaned from her fiber flock of sheep, llamas, and alpacas. Much of her yarn is hand painted (or, as she describes it, “squirted!”), often with dyes from natural sources like nettles and blackberries. There was so much good food to choose from that we had to pass through the edibles tents a few times before finally deciding. My family has a firmly held belief that you can't go wrong with tacos, so we went with bean and pork tacos from Sunderland's Kitchen Garden farm with a side of grilled corn smothered in cheese and chili. I could eat that corn for days. Although the pungent bulb packaged in its own humble paper is part of the festival's namesake and focus, garlic did not overpower the day's events. It made an appearance in many of the dishes, crafts, and games represented, but just as any good ingredient used well is complimented by the entire composition of a dish, it was balanced by the variety of other offerings. We left happy, full, and eager for year 17. My favorite part about recipes is thinking about how a particular recipe came to be. Was it passed down from a family member, created spur-of-the-moment, adapted from a beloved cookbook or chef, or was it a recipe that was simply engrained in one’s memory—no traceable origin to speak of. Food tells many stories. At the LongHouse Food Revival, a weekend-long event hosted by Molly O’Neill of CookNScribble, the stories were just as plentiful as the food. Set in a big old red barn in upstate New York, LongHouse was a retreat for food lovers. The entire weekend was devoted to celebrating the often-overlooked cuisine from the Midwestern part of the United States. It turns out that the so-called “flyover states” have much more to offer in the culinary department than we realize. On Saturday morning, hundreds of food writers, chefs, and food lovers of all kind gathered in the LongHouse barn to hear stories about the Midwest and the food that so many know and love. We heard an ode to Jell-O, the gelatinous treat that originated in Iowa and found its way into neon-green “salads” and different shaped molds across the country. We learned about how farmers managed such a large amount of land, and we were challenged to rethink the word “local” and how it pertains to those living in states that are three, four, even ten times the size of Massachusetts. Culinary historian Michael Twitty talked about his migration from Alabama to Ohio, while author Bruce Kraig spoke of the melting pot, the “ethnic stew” that is the Midwest. Chefs Carlos Gaytan, Ed Lee, Alex Young of Zingerman’s Roadhouse, Neftali Duran and Alicia Walter cooked up a feast of fire roasted vegetables, slow cooked beef, Midwest-inspired grits, coleslaw, and creamy mac and cheese. The star of the show was the 200 lb. pig roast, cooked for over 12 hours! For dessert, we took turns spinning the big pie wheel that decided our fate of which type of pie we would try. But by the end, we weren’t going to let luck get in the way of our favorite slice—so we chose whatever kind we wanted. For me: one slice of blueberry, one slice of cherry, and a generous scoop of Jenni Britton Bauer’s lemon blueberry ice cream. Thank you LongHouse for such a delicious weekend. I’m a Massachusetts girl through and through, but for just a few days, the Midwest stole my heart. It’s 5:30 on a Sunday morning. My alarm goes off and I jump out of bed and into the clothes I laid out the night before. I quickly self-administer two cups of coffee, brush my teeth and hit the road. I’m heading out to Stockbridge, MA to be part of a team working under Brian Alberg, the Executive Chef of the Red Lion Inn at an Outstanding in the Field dinner. For those not familiar with Outstanding events, they are renowned for their food and drink, but also their setting. The venue for today’s event is Lila’s Farm in Great Barrington. After a dark drive on the Pike, I find my way to Alberg’s kitchen by 7:45 (For those of you exploring a career in the culinary arts, there’s a saying in kitchens: “If you’re on time, you’re late.” Always show up 15 minutes before your start time.). Alberg fortifies me with more coffee and I'm ready for the day. Breakfast service at the hotel is already in full swing, and as the rest of our team assembles, we need to stay out of the way of the cooks and porters who are already deep into their workday. Our able crew consists of several members of Alberg’s team as well as teams from The Williams Inn and Allium Restaurant. By 9:00, the The Red Lion Inn van is loaded and ready to head to the site. Alberg’s team has been preparing for this dinner for weeks and our van is full of ingredients: raw, pickled, smoked, fermented, brewed, and distilled. The back of the van is stacked like a expert-level Jenga puzzle, so our drive from Stockbridge to Great Barrington is slow and steady. To our relief, our caravan arrives at Lila’s Farm with everything upright and intact. Alberg gives us all our stations and assignments for the rest of the day and I am excited and terrified to discover that he has appointed me as the lead on hors d’oeuvres for the cocktail reception. I gather my crew and our ingredients and head down the hill to the barn to build our makeshift kitchen and prepare for the reception. If this was a movie, at this point, the day’s activities would have entered the montage stage. Imagine flashing knives, platters flying, faces set in stony concentration, and the occasional playful obscene gesture , all set to a bouncy pop-music beat. After the cocktail hour ends (and a hour has never gone by so fast), we run up the hill to help out with the rest of the meal. As is customary at these events, each course is presented family style, which makes for slightly faster plating, but each plate has a lot of components. No matter how organized things feel when each course’s plating begins, we all end up in a table-top version of Twister: our arms intertwined as we try to get that garnish right, or wipe the spots off a plate. As each course is presented to the tables, we wipe down the plating station and get ready to do it again for the next course. And so it goes until the meal concludes with the kitchen team walking around the table to resounding applause from the diners. During the day I had the chance to speak with a number of the dinner guests. Diners ranged from Outstanding devotees who follow the events around the country and try to attend as many as they can, to locals who are fans of Alberg and the farm, to folks celebrating a special occasion (One gentlemen proposed to his girlfriend at this dinner and yes, she said “yes”!). We load the van back up and drive back to Stockbridge and the Red Lion. Since Alberg has a full crew and someone is always in the kitchen, I am incredibly grateful to hand off the unpacking of the van to the night crew. It’s been a long day, but a great experience. The best way to go to The Big E is to go with a plan. If I leave the fair having seen at least two livestock shows and two statehouses, I feel successful. Anything more than four main attractions means you're spending the whole day, which, for me, is too overwhelming and inevitably too expensive. Since the Statehouses are on the far end of the fairgrounds, it's easy to start with agriculture. The first and most important stop for me is the Mallory Complex, home to sheep, cows, and a handful of goats. Having grown up in far from rural circumstances, I am always amazed when I see a twelve year old deftly primping a cow for competition or nonchalantly leading a ewe into the show ring. One adolescent I met walked me through the different breeds of sheep that she, her friends, and their families raised and then pointed out other breeds around the maze of makeshift indoor ovine pens while explaining which where best for meat, dairy, or fiber. Right beside the main sheep showing arena is the Fiber Nook, a wooly little tunnel of love for knitters, spinners, and all folks who love fiber and the animals that grow it. Along its walls are displays of ribbon-winning fleeces, yarns, and hand knit and crocheted creations. There are needle felting kits, sheepskin hats and slippers, spinning demonstrations, and a few things I can only guess were made with the actual farmer rather than the casual spectator in mind, like mock ear-tag earrings. I stuck to the yarn and after squishing, petting, and practically snuggling nearly every skein, I picked out a hank of an undyed, 50/50 alpaca and wool blend from Portland, Connecticut's Twist of Fate Spinnery. Though there is plenty to eat at the food trucks and stalls leading to and from the midway, my advice is to save yourself for the Statehouses where you'll find everything from artisanal ice cream to Maine smoked salmon, maple cream soda to fresh baked bread. The Statehouse vendors seem to know that it's not just their name on the line - the hometown reputation is at stake as well. There is so much more to The Big E than could possibly be covered in a blog post, so make sure to visit there website here for more information on the full range of events, entertainment, and other offerings. It all ends next Sunday, September 28. Hot, Hot, Heat at Chilifest! On Sunday, we pulled into the driveway at Mike’s Maze for the third annual Chilifest! The sun shone brilliantly against the backdrop of corn, tents, and bands. Hosted by Caroline Pam and Tim Wilcox of The Kitchen Garden, Chilifest! celebrates the noble chili in all varieties, including homegrown exotic peppers, sriracha, salsas, and bowls of spicy stew throughout the two-day festival. Lonesome Brothers, a jangly bluesy front porch kind of band, was on stage when we arrived. David and the boys signed up for a trek through the maze while I wandered over to the chili tent where I tasted fermented chili sauces (regular and habanero) and a trio of salsas (roasted chili salsa, tomatillo salsa, and peach-habanero salsa) all from The Kitchen Garden. Each one was bold, complex, and worthy of a spot in the kitchen pantry. I stopped by the tasting table where voting had started for the hot sauce competition. Ranging in color from soft orange to bright red, I was told they were all hot in varying degrees. I tried the mildest varieties then went on to sample roasted chiles from Marc Greene of Montague Chile Roasters. When the boys finished the maze, the Dire Honeys were playing. David and I split a dark Beastie Rye from The High Horse (Amherst) and jalapeño limeade (my new obsession!) plus a taco plate from The Kitchen Garden. Everything was spot on. We can’t wait for next year.